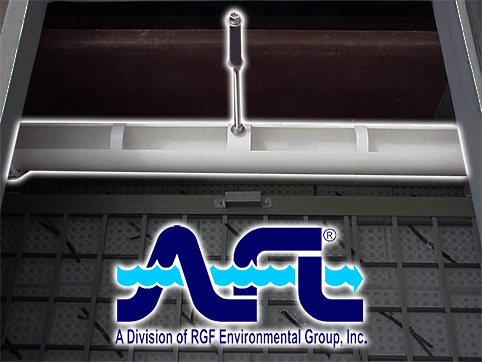 The AFL Rotary Pipe Skimmer is designed to remove floating products such as oil, animal fats, flocculants, etc. from API type separators, clarifiers on skim tanks. Ideal for heavy or viscous product, it can accommodate a heater line from side to side to maintain proper temperatures for product having a tendency to set-up when temperatures get too low. The Rotary Pipe Skimmer can be manually fine-tuned to drain off precisely the amount of oil desired. As the product spills into the skimmer, it flows by gravity out of the skim pipe through the wall of the separator and into a product storage tank for accumulation and subsequent removal. Periodic checks of the product level in the separator are required. Automatic, skimming is possible, but requires a continuous thick product level. The Rotary Pipe Skimmer is constructed of corrosion-proof materials, PVC, and fiberglass; the skimmer can operate in a wide variety of environments with minimal attention to maintenance. The skimmer can be constructed entirely of fiberglass, upon request, to handle extreme temperature or chemical conditions. Removes surfacing liquid and hydrocarbons from continuous phase.